Multi cooker model here is Instant Pot DUO 7-1. The Instant Pot cooks a quarter, half or full pot with the whole wings, drumsticks, turkey drumsticks. The cooking time will be the same. Use to make homemade marinades and seasoning rubs, but these are my favourite ready-made spices; McCormick Smokehouse Maple and Montreal steak seasoning. BBQ charcoal smokiness comes straight from the BBQ grill or smoker. I use liquid smoke to recreate this by adding it to the cooking liquid in the pot. Sweetness is added by using palm sugar or substitute with brown sugar or a combination of sugar and honey (2+2 tbs). 2 lbs chicken wings (frozen or thawed) I used a combination of 1 kg chicken wings (wingtips with drumettes attached) plus 1 kg chopped Chicken legs (in 3 pieces). For a little bit of heat, I added a blend of 1 teaspoon crushed cayenne pepper and 1 tsp crushed chilli peppers. Change the flavours by alternating between Thai Siracha sauce, (Indonesian Sambal paste), Sambal Badjak. A bit closer to home opt for Portuguese/African Piri Piri spice blend 1-2 tbs. My dinner guests will ultimately inspire the level of heat and spiciness. Make your own sugar-free bbq sauce or order online a good brand as in the recommendation ads here below. For my smoothies and baked goods, I use erythritol, inulin, stevia and Chinese Lo Han Guo as sweeteners. 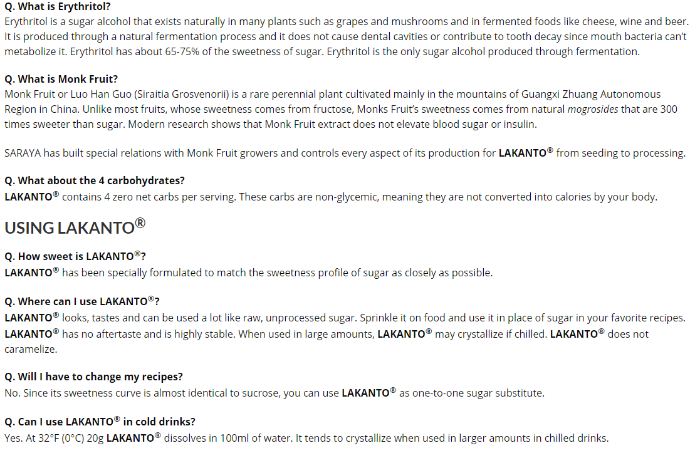 Favourite sugar-free option I recommend Lakanto monk fruit sugar it has 0 calories. Great sweet taste no off flavours as with stevia. You also can use Lakanto sugar-free maple syrup instead of honey. 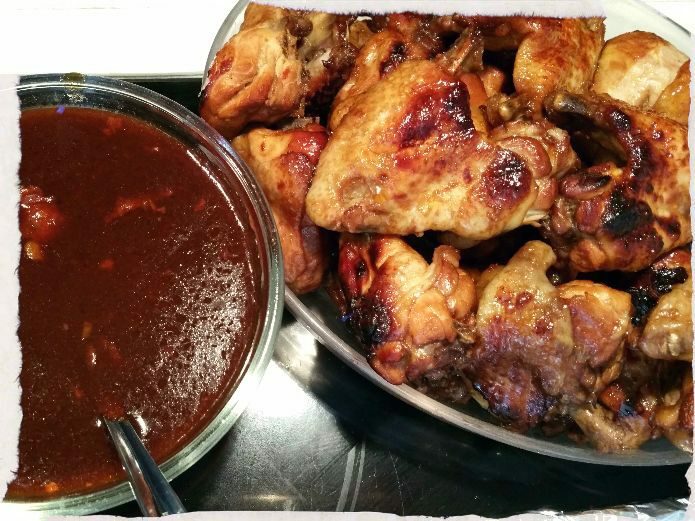 For sticky BBQ chicken wings use this sugar-free option to substitute for using high-calorie sugars. Luo Han Guo is a low-caloric, low-glycemic food used as a sweetener in beverages and cooked food. Using this sweetener in Chinese herbal teas and cooking I am familiar with the level of sweetness. It never occurred to me how beneficial the health benefits are having a hidden agent as a health aid. Luo Han Guo, monk fruit is native to southern China. In TCM (Traditional Chinese Medicine) it is been used as a traditional medicine to treat obesity and diabetes. Luo Han Guo is a low-caloric, low-glycemic food used as a sweetener in beverages and cooked food extremely sweet (about 300 times as sweet as sugar). You can purchase this online or purchase Lo Han Guo tea and powder at Asian and Chinese supermarkets and Chinese herbal shops. Disclaimer: This post contains affiliate links By purchasing through these links Asianfoodtrail earns a small commission, however you pay the same price for the item (it does not increase). The full disclaimer and disclosure transcript link can be found on the left sidebar or click here. 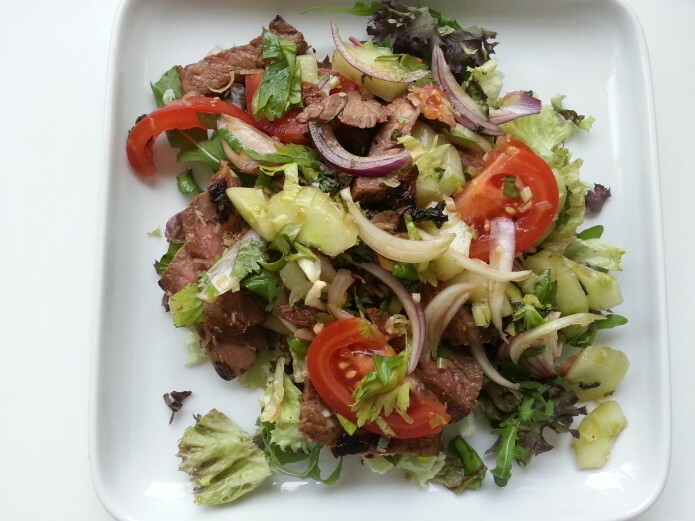 Thai beef salad recipe with authentic aromatic flavours and an enticing complexity of sweet, sour, spice and heat combined with grilled marinated meat. This dish is one of our family & friends favourites. Quick and easy to prepare, serve the salad as a starter for lunch or as a side with other complimentary dishes together as Thai dinner theme. The recipe as always retrieved from my memory vault with all the ingredients and steps but no good food photographs. I couldn’t have a better excuse to make this dish today. Usually, as soon as the dish arrives at the table it disappears to late to make any snapshots. Prepping the dish received much enthusiasm of my better half he replied: “Somebody got to eat happily to help :-)”. 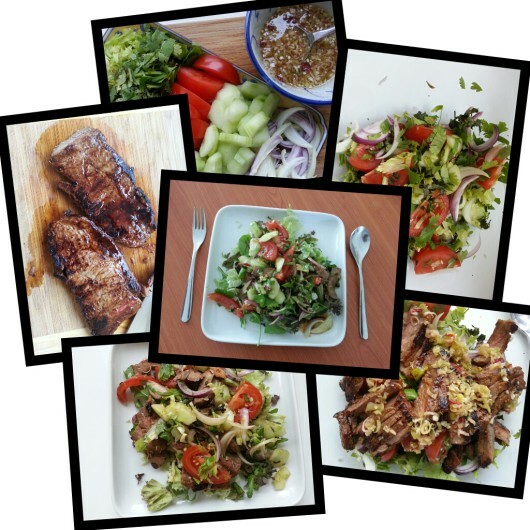 The family loves salad and Thai beef salad ranks on top of all time favourites in our house. We actually moved and lived in Asia for more than a decade. Taiwan became our second home but Thailand was very close sharing the same position, both destinations were foodies paradise. I visited Thailand for the very first time by invitation to come along with friends. My husband couldn’t accompany me so my sister joined as a travel companion. We both thoroughly enjoyed our sister’s holiday and Thai cuisine. Of the many dishes we devoured, YumNua Yang a.k.a. Yum Neua was among the first plates of much more to come. We re-visited Thailand on many more occasions travelling through all the regions. The roadside street food stalls, night food markets or restaurants beautiful plated and served local style. The heart of this dish must be a good piece of beef, sirloin or steak cut. 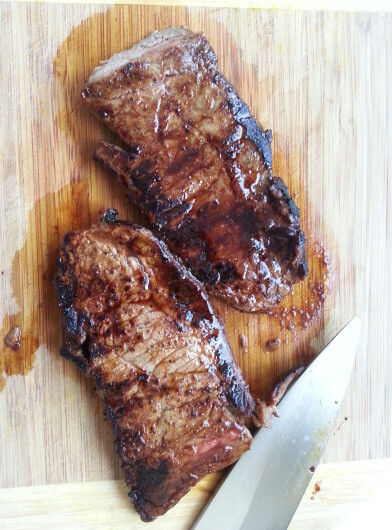 Cheaper cuts like a skirt or flank steak after grilling let it rest (10min.) before cutting. Next is the authentic fresh made dressing of fish sauce, garlic, bird’s eye chilli, palm sugar, lime juice, coriander, Thai/Chinese celery. Mint and lemongrass (optional). To create Thai flavours, you have to look at the ingredients and some of them just can’t be ignored or simply substituted, the basis is fish sauce, just buy a small bottle don’t think for a minute to easily replace this with vinegar or soy sauce. Vinegar only has acidity no umami (savoury taste/flavour), I love soy sauce but it will not do justice to this dish, same counts for palm sugar if you don’t have then rather use brown or cane sugar it adds more depth than white sugar. Lime or lemon juice it is just a subtle contrast but when you grate the rind it will release essential oils, the scent enables you to tell and smell the difference. Coriander is an essential herb as is celery and lemongrass add fragrance to the whole dish bringing it all together to the next level. They are actually irreplaceable if left out everyone will notice something is missing even while you have a good steak on your plate. The dressing needs to have the complexity of sweet, sour, spice, heat and fragrance to make YumNua or leave it bland and that would put the dish to shame. In this recipe, I have marinated the meat beforehand it is worth the wait and effort to add this step, use a bit of fish sauce with black and white pepper and a dash of Chinese cooking wine (optional). You will find the recipe in the recipe box here below, enjoy this wonderful dish. Try and enjoy your own home-made YumNua Yang, Thai beef salad! With every summer this recipe is trending on our Instagram and FB Page as a popular recipe easy to make and enjoy. For dieters following Keto, Paleo diet based on LCHF or Type 2 diabetes this dish is perfect with the following dietary adjustments. In Thai cooking Palm sugar is often used and advertised with health claims having low glycemic index, however, this does not directly apply for sweeteners. For Bulletproof fans “Coconut palm sugar is not Bulletproof period“, click the link for a post by guru David Asprey. I recommend Lakanto all natural sweetener, a product of Chinese Luo Han Guo aka monk fruit sugar to replace standard sugar. In Traditional Chinese Medicine (TCM) the healing properties have been known for centuries. Luo Han Guo is native to southern China and northern Thailand. You can easily buy this fruit in dried powdered form at larger Asian supermarkets and fresh when the season arrives, they are exported and available for a short period to eat or use the fruit in cooking.